I believe that the Vatican II Hierarchy is presenting Our Lady’s message in a way opposed to the truth. In fact, they are using the silent apparition at Knock to promote Progressivism, false religions and the new morality. The evidence I will present is from a 39-minute film entitled The Story of Knock. 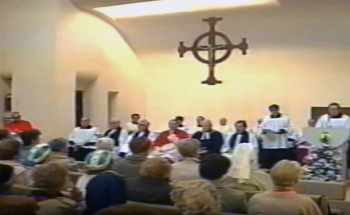 In 1988, a promotional film called The Story of Knock was produced after Pope John Paul II’s visit to the Knock Shrine in 1979 – the celebration of the centenary of the apparition [34:47 minute mark]. This film has become the most widely known professional film concerning the apparition of Knock and its Shrine. It can be found free online. 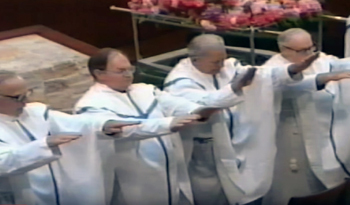 The Story of Knock features footage of the Knock Shrine grounds and ceremonies and interviews from the highest ranking clergy involved with Knock. It is a clear demonstration of how the Vatican II Hierarchy wishes to present Knock and its meaning to the public. Throughout the film we hear repeatedly the chorus of Lady of Knock, a song written in 1981 that has become something akin to the official theme song for the Knock apparition. As I kneel with love before thee. 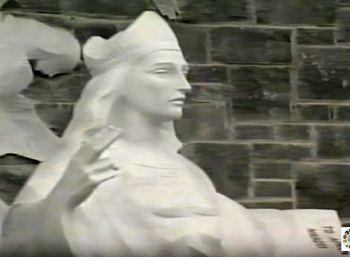 Lady of Knock, our Queen of Peace. It is wrong to be indifferent to the tears, burdens and concerns of Our Lady. As Catholics do we not pray that our hearts be like unto hers? Wise and Immaculate Heart of Mary, Make my heart like unto thine (Cor Sapientiale et Immaculatum Mariae, fac cor meum secundum cor tuum). If we add the portending message of Fatima, there is even greater reason to be heedful. As a matter of fact, times of the greatest concern are often accompanied by a very profound silence. In many places this video presents the casual, immodest, inappropriate and disrespectful attire that has become common place among lay people in the post-Vatican II epoch. Even in the presence of the Blessed Sacrament, we see the visitors of Our Lady’s Shrine wearing shorts, T-shirts, jeans, women wearing pants, casual and extravagant cloths [7:45]. If we consider that this film was made about 30 years ago, then, it should be seen as a beginning of the current amoral World Youth Day style. 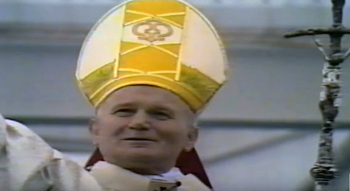 Besides the shabby attire, the video is replete with Novus Ordo Masses, concelebrated Masses [24:02], Communion in the Hand [30:22], Guitar Masses [18:08] and other novelties of Vatican II ceremonies [4:42]. By 1988, ”social justice” had already become a synonym for Liberation Theology and other socialist/communist agendas, especially in the Third World. We who live in 2017 are witnessing 30 years later the dire consequences of this so-called social justice that exploded with Vatican II and has fallen to unimaginable depths in the reign of Pope Francis. Would Our Lady appear just to repeat what the faithful already know and have known since the beginning of the Church? Apparitions of Our Lady are far too rare to not have a purpose. So, the statements listed above, even though they are true, cannot be the reason Our Lady appeared at Knock. This official promotion of heretics, schismatics and other false religions at the Shrine is a disgraceful, sacrilegious defilement of Our Lady’s apparition and an affront to the messages of Knock, La Salette, Lourdes and Fatima. Yet, in the film, the word Apocalypse is not spoken, not even once. It is safe to say that it is deliberately avoided. At the 23:15 minute mark, St. John is simply described as the “writer of the fourth Gospel and of three of the letters of the New Testament,” nothing more. So, here we have the astonishing fact that a promotional film about Knock, produced by the Catholic Hierarchy and with its full cooperation, avoids mentioning his prophetic book. 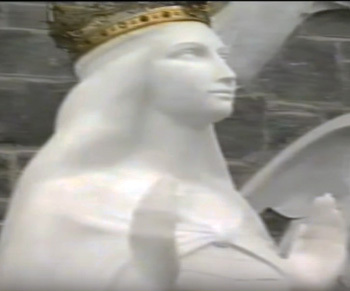 The shocking absence of any mention of the Apocalypse demonstrates, I believe, a deliberate intent to avoid a serious investigation of the true message Our Lady gave at Knock. It seems as if panic is raised at the mere thought of linking Our Lady’s apparition with anything concerning the Apocalypse. The child says he saw images, beautiful images, the Blessed Virgin and St. Joseph. He could state no more than that he saw the fine images and the light, and heard the people talk of them, and climbed the wall to see the nice things and the lights.